Spinsters and Lunatics: Kitten Update! 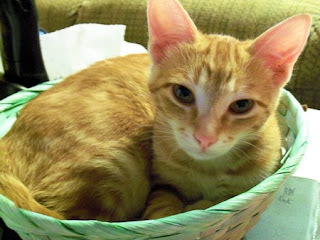 First up, Cody, pretending to be a sweet potato in the veggie basket on the counter. He's not supposed to be on the counter, and mostly we do try to keep him off with the water bottle treatment (they so hate being sprayed). But he's so cute in the basket, I didn't have the heart to pull out the water bottle and shoo him away. Now that's the life. 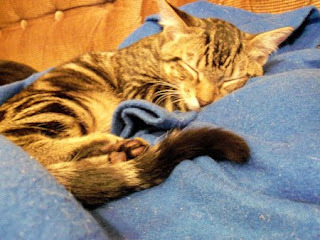 Lying on the Snuggie, dreaming about chasing things—what more could a little kitty want? Aw, Paula, they are gorgeous. And oh, how they've grown! They have a wonderful life now, thanks to you. Thanks so much for the update and pics!